A spin-off of a spin-off? Can it really be any good? BeyRaiderz is a spin-off of BeyWarriors, which is a spin-off of Beyblade. That being said, I was went into BeyRaiderz with optimism. 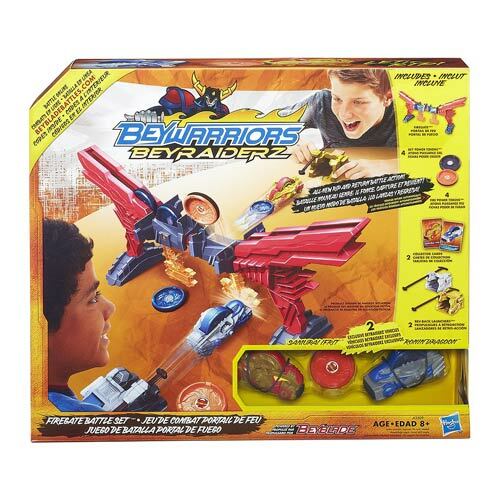 My kids and I received a BeyRaiderz Firegate Battle Set and a BeyRaiderz Chamber Challenge Action Figure Set. That gave us two Raiderz and two “arenas” to play with. The gimmick behind BeyRaiderz is that they come back to you after you launch them. On the front of each Raider is a small strip of Velcro. You use this to snag tokens and return them to you. When you rev up a Raider, you’re basically spinning up the wheel in the reverse direction you’re going to launch it. You slam the launcher to shoot the Raider forward, then the reverse power of the wheel makes contact with the floor and it comes racing back, hopefully with a token attached. The Firegate Battle Set is pretty straight forward. You need to hit a target to drop your tokens to the floor. Snag all your tokens before the other player to win. It’s fun, but it got old quick. The Chamber Challenge Set, on the other hand, was a ton of fun. The set has a bunch of triggers to launch 4 discs to the floor, and ramps that can be triggered to unveil that last token in the middle of the set. It’s a race to see who can knock out the tokens and get a majority of them to their side. There’s plenty of back and forth as your Raiderz speed around, knocking into each other, fighting over tokens, and struggling to make their way back to you. Each Raider is also customizable. You can change out both the Velcro tip and rear wheel for more precision and friction with the floor. Overall I’d say BeyRaiderz are a win. They’re not as cool, customizable, or strategic as Beyblades, but they’re a whole lot of fun to play with. A copy of the Firegate Battle Set and Chamber Challenge Set were provided free for review by Hasbro.